Human rights, although largely described as a modern term, are indeed as old as the history of mankind. The age we live has been deemed the age of human rights, yet it is also an age of individual and massive violations of these rights at the same time. There is no longer respect for fundamental rights and freedoms, even in democratic countries. What’s more, democratic states, which were champions in defending human rights in the past, have now become a source of violations. Today, we mark Human Rights Week in a chaotic time where basic rights are easily violated. Interestingly, the following week will include Dec. 17, the day of Mawlana Jalal ad-Din Muhammad Rumi’s death. Therefore, it is worth remembering that Rumi is still one of the world’s most inspiring scholars when it comes to human rights. Mawlana Jalal ad-Din (1207-1273), better known in the West as Rumi, was one of the greatest thinkers, spiritual masters and mystic poets of all time. From the 13th century to present day, his legacy has guided whoever wanted to discover himself/herself, to understand the meaning of life and to find truth. Rumi has also been a perfect source of inspiration in terms of social development and finding solutions to universal problems. His influence has crossed cultural and national boundaries. Rumi has many things to say about the understanding of this age and has made great contributions in the field of human rights. His thoughts are still valid and reveal the unchanging essence inside people and express the basic and universal values of modern societies. Rumi tells about justice, or what is also called a state of law or rule of law in our age. Many actions that he regards as cruelty, from which he tells people to refrain, are called violations of human rights today. Human dignity and social justice are at the center of his world of thought. He was called Mawlana (Our Master) because he defended human rights without discrimination and struggled for the prosperity of all people and for fair and good governance. Rumi’s human rights understanding is different from today’s definition due to its holistic expression. First of all, from his point of view, a person is not just a simple, ordinary creature that solely consists of flesh and blood, but human beings possess a perfect system with material and spiritual dimensions, the essence of the universe and the purpose of its creation. According to many, Rumi’s view played a big role in the formation of his understanding of universal human rights. It can be said that there are four principals shaping this understanding: Human dignity, the aim of being, the principle of unity and the principle of equality. In modern times, the concept of human dignity is directly linked with human rights. It is generally accepted that the main objective of human rights regulations is the protection of dignity. Undoubtedly, Rumi’s view describing people as macrocosms is far more comprehensive, deeper and more holistic than today’s limited human rights definitions and practices. “You are more precious than heaven and earth. “You are another version of the divine book. You are a mirror of the beauty of God that created the universe. Whatever exists in the world, it’s not outside of you. “If I tell you the value of this priceless jewelry, I burn, the listener also burns,” Rumi quotes. Rumi, in his works, repeatedly emphasized man’s superiority. “The aim of the creation of the universe is man,” he said. 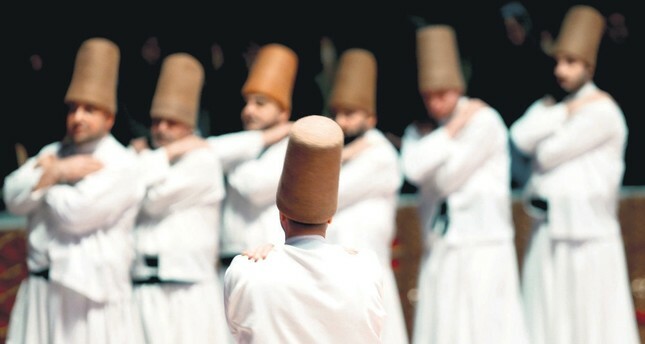 Sufi performers during a commemoration ceremony of late Muslim scholar Mawlana Jalal ad-Din Rumi in his hometown, Konya, Turkey. Human rights, in its broadest definition, mean undeniable and indispensable natural acquirements arising from the fact that a person exists as a human being. It is universal and applies without discrimination for all. Based on human dignity and individual value, its ultimate aim is to protect these concepts. Early history of Islam needs fresh appraisal.